Keep an eye out for this new film hitting cinemas in 2011 - the Battle of Los Anegeles. Based on the true story of the real 1942 Ufo attack in Los Angeles which i have written about over the years . 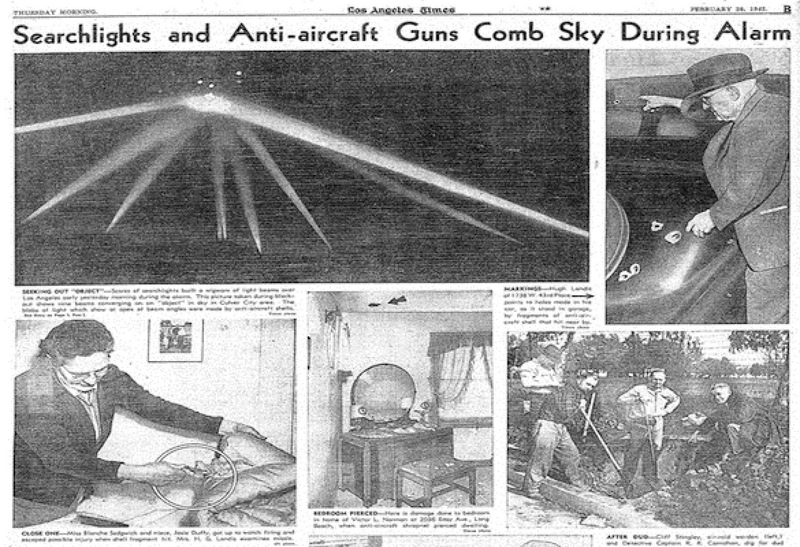 The footage opens with a little background on the 1942 Battle of Los Angeles, when anti-aircraft artillery responded to reports of an unknown aircraft. It then switches to a more modern-day Los Angeles, clearly under enemy fire, although the nature of the fire isn't entirely clear. As the military evacuates LA, a Marine platoon is ordered to find a group of survivors and bring them back to the evacuation point. But time is short; the Armed Forces plan to bomb LA in just three hours, hoping to obliterate the invading army. The Marines clearly know little about these invaders, except that they are "not of this world." 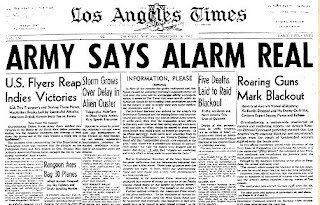 Predating the Roswell incident in 1947 - americas most important Ufo incident - Just What was hovering above Los Angeles on February 25, 1942? The Battle of Los Angeles is the name given by contemporary news agencies to a sighting of one or more unidentified flying objects which took place from late February 24 to early February 25, 1942 in which eyewitness reports of an unknown object or objects over Los Angeles, California, triggered a massive anti-aircraft artillery barrage. The Los Angeles incident occurred less than three months after America's entry into World War II as a result of the attack on Pearl Harbor. Army officer "if 1000 rounds of ammunition can't bring one plane down then their not planes"
Overshadowing a nation-wide maelstrom of rumors and conflicting reports, the Army's Western Defense Command insisted that Los Angeles' early morning blackout and anti-aircraft action were the result of unidentified aircraft sighted over the beach area. In two official statements, issued while Secretary of the Navy Knox in Washington was attributing the activity to a false alarm and "jittery nerves," the command in San Francisco confirmed and reconfirmed the presence over the Southland of unidentified planes. Relayed by the Southern California sector office in Pasadena, the second statement read: "The aircraft which caused the blackout in the Los Angeles area for several hours this a.m. have not been identified." Insistence from official quarters that the alarm was real came as hundreds of thousands of citizens who heard and saw the activity spread countless varying stories of the episode. The spectacular anti-aircraft barrage came after the 14th Interceptor Command ordered the blackout when strange craft were reported over the coastline. 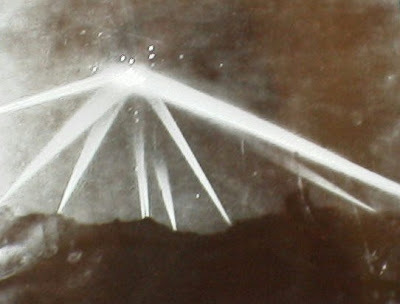 Powerful searchlights from countless stations stabbed the sky with brilliant probing fingers while anti-aircraft batteries dotted the heavens with beautiful, if sinister, orange bursts of shrapnel. This is one of the most intriguing of all ufo cases, imo. I don't buy the 'weather balloon' explanation (though it would account for failing to shoot it down: it would probably have been well out of the range of AA batteries). But given that America was on a war footing, and that only a few years previously Orson Welles had shown how easy it was to create mass panic with a radio broadcast of an entirely fictitious alien invasion, I do wonder whether this is a genuine ufo event or an example of mass hysteria. We'll probably never get to the bottom of it, but it's absolutely fascinating whatever the explanation. Were those lights over England flares?